The future may not be certain, but the values of libraries are. Through better preparation, defence of their principles, and a readiness to seize opportunities, libraries can underline their social and civic role, now and in the long term. 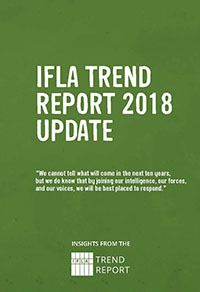 The IFLA Trend Report Update 2018 explores the challenges of uncertainty, and offers ideas on how libraries can respond. PreviousPrevious post:Seizing Opportunities, Delivering Development: IFLA and the UN 2030 AgendaNextNext post:Have your say: don’t miss the General Assembly! Goodbye Kuala Lumpur, hello Athens! Don’t miss the Closing Session! Have your say: don’t miss the General Assembly!